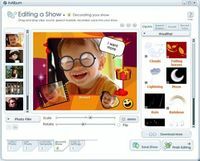 FotoSlate 4 Photo Print Studio takes your photo printing to a whole new creative level.In no time you'll create scrapbook-style photo albums, greeting cards, calendars, CD or DVD covers, photo collages and photo layouts. 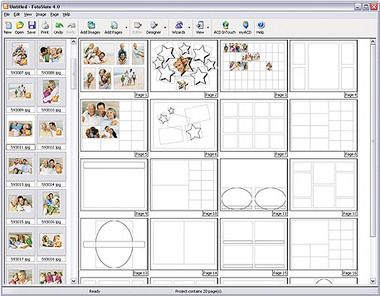 And you'll do it all quickly and easily using FotoSlate's helpful wizards and templates. Create a photo project in three easy steps. Select a photo layout, pick your images, drag and drop them into your project and you're done. Then, just print it out instantly or share it by email. 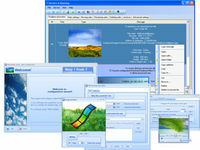 FotoSlate lets you save your projects as .pdf or .jpg for easy and secure file sharing. FotoSlate has the photo layout templates you need. Let your imagination run wild by quickly creating your own custom layout with the Page Designer. Plus, you can use FotoSlate's powerful editing tools to correct colors or turn a photo black and white. Crop or sharpen an image easily. Just a few clicks and your photo's polished. Add scrapbook-style elements to any of FotoSlate's album templates. Create drop shadows, freely rotate text and photos for a collage effect. Use your own photo as a background, crop them into stars, hearts, ovals and more. Design a page that's as unique as your memories. 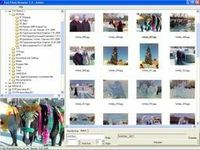 Create impressive photo calendars using our handy wizards. Personalize your calendar with holidays and your own special days.